Bloggers are a fantastic springboard for such a strategy because they are easiest to search for contextually and granularly as opposed to searching for influencers on other channels. Bloggers also tend to be active on a plethora of channels since they need to promote their blog just like your brand needs to promote itself. Crystal Rapinchuk runs the blog Surviving a Teacher’s Salary and was part of the Daily Cocktail’s and Wholly Guacamole campaign. As we saw in this example, brands have a lot of room to be creative and diverse in their tactics when marketing across many channels at once. Crystal was reached out to by Rinck Advertising on behalf of the two brands because her blog was a contextual fit with their campaign and because she has a strong Twitter and Facebook presence. Working with influencers who have strong presences on many channels allowed the two brands to come up with a different strategy to reach potential consumers per channel. Wholly Guacamole and Daily’s Cocktails were able to reach millions of people in efficient ways using the multi-channel approach. Why Market Across Multiple Channels? Consumers aren’t looking for information in only one place – your brand needs to be talked about everywhere. While campaigns are becoming strategies instead of tactics with end points, marketers need to make sure their brand has an ongoing presence on all channels. Your brand talks to one influencer in who talks to many consumers on many channels. Consumers want to personalize the way they digest their information so let them do it by finding information different ways by the same influencer who is posting all over the digital world. When Crystal agreed to be part of Rinck Advertising’s campaign, she wrote a blog post, hosted a Twitter party, posted on Facebook, pinned on Pinterest and even hosted a giveaway on her blog for the campaign. That’s a lot of exposure that one person can provide for brands. Think of it this way, bloggers are invested in their blog just like a brand is invested in promoting themselves. So, as they promote themselves across many channels, they are in turn promoting brands in this way as well. It works out great for us marketers. The Power of Creativity: “It was such a fun event that it definitely made my job easier.” Crystal emphasized how fun the party was to host and loved that she wouldn’t have normally hosted an Oscar themed party if it weren’t for Rinck coming up with the idea and sending her all the supplies to do so. She had a blast and it certainly shows in her post. Whether you’re using a holiday or cultural event as a promotion springboard or you find a visually driven way for a blogger to spread a message, you should not spend the time and compensation on working with influencers until you’ve got a creative element to all of your strategies or plans of attack. Organization: One of Crystal’s favorite things about working with Rinck and Wholly Guacamole was how organized the campaign was. Crystal stressed how much she liked that she knew exactly what was expected of her for the event and Rinck Advertising sent her plenty of product and logo’d items so she was able to create some great visual aids for her posts, tweets, pins and Facebook updates. 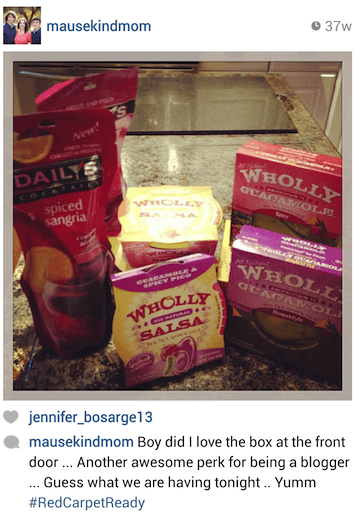 Crystal chose to partake in the giveaway run with Daily’s Cocktails and Wholly Guacamole and was impressed by the fact that Rinck Advertising took charge of shipping out the prizes to the winners. Varied Information Delivery: When working with a blogger, you know they are most likely going to do a blog post but you also need to have a solid plan when it comes to finding ways to engage their networks for each of their channels. Have a unique hashtag already planned out, a visually driven idea for Instagram, and a theme for a Pinterest board. While you’re brand is gaining new consumers and followers because of the work that bloggers put in to building a loyal following on their digital channels, never forget to make sure the relationship is always mutually beneficial. These bloggers have the potential to drive a ton of new leads, sales and awareness to your brand. An ongoing relationship—the type that leads to advocacy as opposed to simple awareness—is the result or a strong brand-blogger-relationship and the thing is, every blogger I’ve chatted with desires this type of connection with the brands they like. In case you missed it: an ongoing relationship is best for both parties. As the relationship grows on each side, both parties bring more and more to the table and continue to benefit each other. Crystal advises that a relationship full of communication on both sides can lead to growth in new areas as the brand and blogger shed new perspectives and ideas on other areas. Listen to each other’s ideas, they just may be little gems waiting to be found! Whether it’s co-campaigning with another brand or collaborating instead of campaigning with a blogger, better results are achieved when things are done in pairs and more than one idea is acknowledged. Do you have an example of an awesome blogger outreach campaign to share? Whether it’s one you’ve seen or were part of I would love to hear about it in the comments below. Additionally, if you’d like to be featured in my weekly post contact me at kristen@grouphigh.com and let’s talk about your campaign!